Add teff flour, almond flour, tapioca flour, salt and baking powder to a large mixing bowl and stir to combine. In a separate bowl, stir together powdered chia, 2 tablespoons olive oil, apple cider vinegar, water and egg. Set aside for 15 minutes until it gels. Stir the wet ingredients into the dry ingredients and knead to form a smooth, pliable dough ball. Place the dough ball between two sheets of parchment paper, then roll out into a 12 inch disc, ¼ inch thick. Gently tuck the edges under and pinch to form a crust. Brush crust with 1 tablespoon olive oil. Bake crust in a 350°F oven for 18 minutes, until firm and dry. On a baking sheet, spread out the squash and Brussels sprouts on separate halves. Drizzle with 1 teaspoon olive oil, toss, and sprinkle with smoked paprika, salt, pepper and maple syrup. Bake for 12 minutes, until squash is tender and Brussels sprouts are just beginning to brown. Spread minced garlic and more olive oil over the pre-baked crust, and squeeze the juice of ½ a lemon over top. 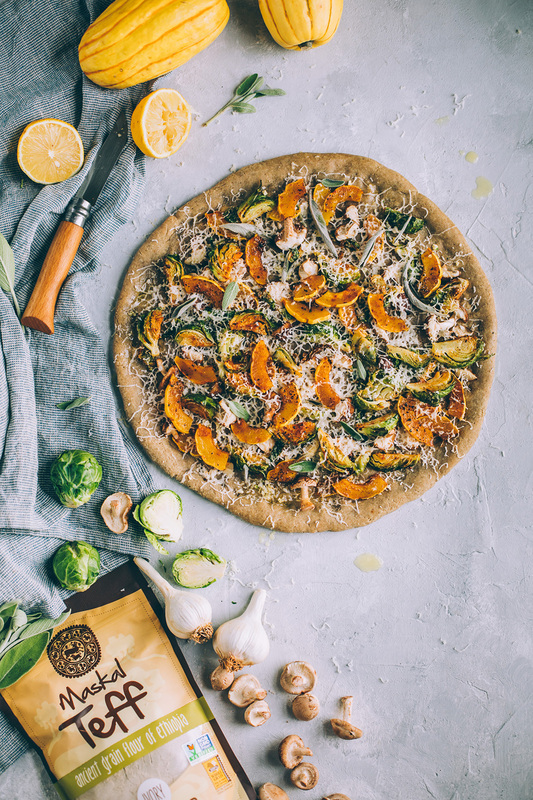 Scatter the mushrooms, cooked squash and Brussels sprouts on top of the pizza. Add cheese, sage, and season with salt and pepper.